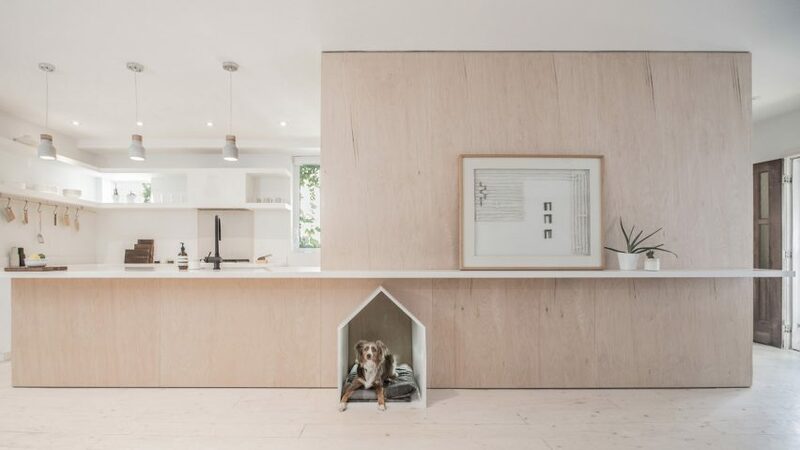 A sleeping area for the family dog is the focal point of this house in Toronto, which Canadian architecture firm StudioAC renovated using a plywood insertion to add storage space. The two-storey Sheridan Residence, measuring 1,500 square metres (139 square feet), was fully renovated by the local firm. They added a unit built from plywood to divide up the ground floor, creating a foyer, a living and dining area, and a kitchen that wrap around the central wooden box. The floor-to-ceiling volume encloses storage spaces and hides the staircase, and extends out at counter level to provide additional kitchen workspace. "For this small west Toronto renovation, rather than imagine a home comprised of rooms within an open plan we conceived a room revolving around a singular mass," said StudioAC. But most importantly for the clients, it holds a small house-shaped nook where their dog Rusty can sleep. "The genesis of producing a space for the pup came out of a simple line in the brief, requesting we consider a space for a dog bed," the studio said. "With such a modest amount of space it wasn't an insignificant request." The kitchen is designed with all-white surfaces and a high-gloss backsplash to reflect light in the space. Upstairs are two bedrooms, a bathroom, and a master bedroom with en-suite, all following the white and wooden palette that runs throughout the home. The staircase has white-washed wooden steps to match the walls, and wide-plank timber floors are stained a light colour to blend in with the plywood. StudioAC has renovated two other homes in Toronto with a similar aesthetic. They include an apartment with timber enclosures that highlight the residence's structural core and another that has a bedroom housed inside a millwork box with a white archway. Photography is by Sarjoun Faour.